Wadler's Blog: Caroline Lucas standing in a field waving a placard? Outrageous! Caroline Lucas standing in a field waving a placard? Outrageous! 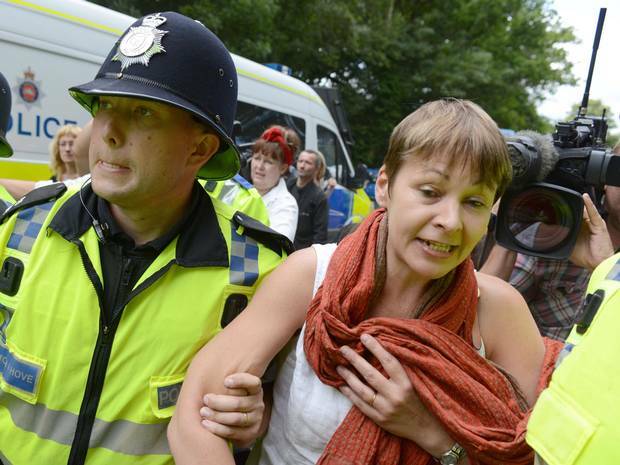 Mark Steele's commentary nails the absurd state of modern Britain, taking as a starting point Caroline Lucas's recent arrest for protesting fracking. At last, a politician has been arrested. The one they’ve taken in is Caroline Lucas, the Green MP, because of all the lousy things you can remember politicians doing in recent years, have any been as filthy as what she did this week, standing in a field with a placard? Some MPs, such as Stephen Byers and others, were filmed promising to use their status to offer access to ministers, if you paid them between £3,000 and £5,000 a day. That could be seen, if you were picky about morals, as abusing your position slightly, but he only needed a mild caution, because at least he didn’t bring the good name of Parliament into disrepute by standing in front of a tree protesting about fracking. If Caroline Lucas had any decency, instead of writing a slogan about protecting the environment on that placard, she’d have sold the space for advertising. She could still have had “Stop Climate Change” in one corner, but the rest of it would have been sold for £3,000 to £5,000 to someone reputable such as British Aerospace, and say something like “There’ll be sod-all to frack after our bombs attack”, and the reputation of our government would be intact.